CLEARANCE ITEM: BRAND NEW WITH TAGS ATTACHED IN MEN'S SIZES ONLY. ALL SALES FINAL. NO RETURNS OR EXCHANGES FOR THIS ITEM. When it comes to innovative designs and technology for footwear, Tactical Research leads the charge. The TR696Z-CT Flyweight Sage Green Composite Toe Side Zipper Boot was made for Air Force Airmen looking for a lightweight boot with the protection of a composite toe and the convenience of a side zipper. It features a micro-suede and 100% nylon Cordura upper for high breathability, low maintenance, and low weight. The TR696Z-CT is ideal for the flight line, maintenance depots, or other environments where foot protection is required. Double and triple stitched seams provide strength and durability. 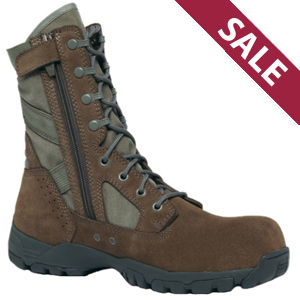 Also, the TR-1 insole provides running shoe comfort in a tactical boot. The Tactical Research TR696Z-CT is approved for wear with the U.S. Air Force Airman Battle Uniform (ABU). Tactical Research Boots run true to size. Consider ordering your running or athletic shoe size.